Just when you think your life is fine, the universe has something else in store for you. 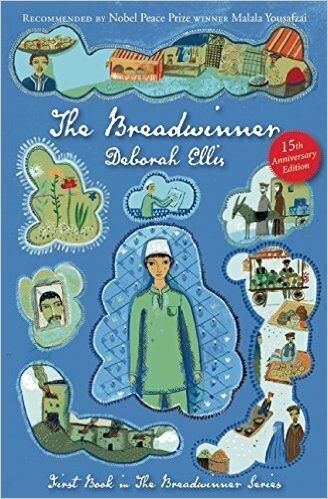 Recommended by Nobel Peace Prize Winner, Malala Yousafzai, and soon to be made into a movie by Angelina Jolie, The Breadwinner by Deborah Ellis is a gem that touches your heart with such purity. The book published in 2000 is devoid of the superficial; it tells a story with simplicity, without pretense, and an authenticity that resonates across cultural boundaries. The Breadwinner (published by House of Anansi) is actually the first book the series, and the fifteenth anniversary edition has recently been released. The story's main protagonist is Parvana. Her home is Kabul, Afghanistan. Her family consists of her father, mother, older sister Nooria and two younger siblings, Maryam and Ali. As her father is arrested and the family left with no one to take care of them the struggle to survive ensues. How will the family pull together in the face of this adversity? Underneath the facade of political life, is a story of a family who work together and overcome the hardships that have unjustly confronted them. Author Deborah Ellis did not just pick up a pen and paper one day and start to create fiction from thin air. Instead, she did her due diligence, interviewing women and girls in refugee camps in Pakistan. There is a strong focus on the determination of women and their courage to fight against adversity. The book has also received several literary awards, including the Peter Pan Prize and the Middle East Book Award in 2002. The story is relatable in light of today's events. And, The Breadwinner is a reminder for us in the West, that the the focus of unjust brutality is not just reserved for us.